From my research for The End Of War, I knew that, upon FDR's death at the Little White House in Warm Springs, GA, in April of '45, his security chief gathered up all the food the president had eaten that day and had it checked for poison. Also, upon hearing that Roosevelt was dead from our U.S. ambassador, Marshall Stalin insisted the American State Department check his body for poison. So, I decided to tell a what-if story. What if FDR didn't throw an embolism, but was, indeed, poisoned? I designed the assassin, the way in, and the way out through all the layers of protection around him. I invented the reasons and the culprits, and the man trying to figure it all out, political science professor Lammeck. An interesting note: if you read the opening to the published script for Quentin Tarantino's Inglorious Basterds, you will see I wrote the introduction. Tarantino credited The Assassins Gallery for inspiring his script; by killing FDR so plausibly, he said, he realized that he could murder Hitler in his film, another what-if of historic proportions. Kinda cool. 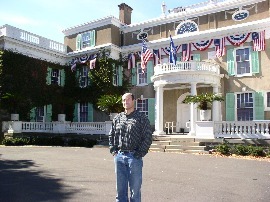 Outside the Hyde Park, NY, home of the Roosevelts, where I reviewed the servants' and butlers' records, to capture FDR's comings and goings. 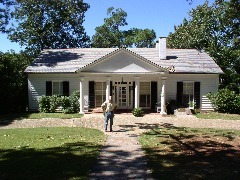 The Little White House, in Warm Springs, GA, where FDR went regularly for the soothing natural springs. He died inside. 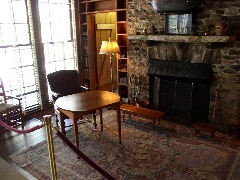 Inside the Little White House; FDR passed away while sitting in this chair posing for a portrait.